POLITICAL tempers flared again yesterday after police blocked opposition MDC Alliance leader Nelson Chamisa’s “thank you” campaign rally scheduled for Kwekwe this weekend, with the latter’s supporters threatening to defy the ban. Chamisa, who still insists he won the July 30 presidential poll against incumbent President Emmerson Mnangagwa, had intended to go back to his supporters to thank them for “overwhelmingly voting him as president”. His supporters yesterday vowed to defy the police ban and proceed with the rally, arguing that they viewed the blockade as a clampdown on the country’s democratic space. This came a month after MDC Alliance activists engaged in fierce running battles with the police in Harare, culminating in the fatal shooting of seven people after soldiers intervened and fired live rounds into the city’s crowded streets. In a written response to the MDC-T Kwekwe district chairperson Charles Madhihwa, Kwekwe police said the planned rally could not proceed because of a typhoid outbreak which has hit the nearby Midlands capital, Gweru. “There has been a typhoid outbreak in the province. Health officials are not allowing the public gathering,” Kwekwe police boss Chief Superintendent Conrad Mubaiwa said. But MDC Alliance’s Mbizo constituency MP-elect, Settlement Chikwinya, who was involved in organising the rally, told NewsDay that the ban was a rude awakening to Zimbabweans that the Zanu PF-led government was not ready to depart from its past. He warned that the opposition party would not take the directive lying down. “The blocking of the rally, which is ostensibly sheltered as a health safety measure, is actually a closure of political space by a regime that knows the general public sentiment following the grand theft of the July 30 presidential elections,” Chikwinya said. Chikwinya said the party had made a resolution to proceed with the rally despite the ban, saying they had made their own inquisition with Kwekwe district medical officer, Patricia Mapanda, who denied knowledge of the health alert. “We view the decision by the police to be purely political and partisan and, for that reason, we have resolved to go ahead with the rally and ignore the ban,” he said. A State security agent who preferred anonymity said there were fears that Chamisa could rally his supporters to protest against the government and there were attempts to contain the wave. “The general feeling is that the rallies could be used to galvanise violent protests, the kind that rocked Harare on August 1. So the move is to ensure that the rallies don’t happen,” the source said. 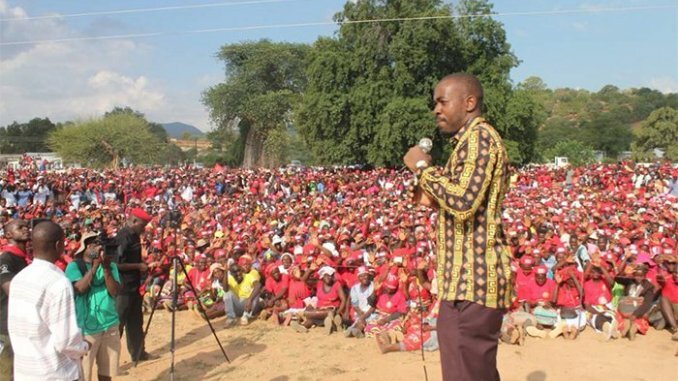 Chamisa has lined up countrywide “thank you” rallies, where he will also use as platforms to get feedback from his supporters on the way forward following the alleged theft of his victory by the Zimbabwe Electoral Commission and Zanu PF, in favour of Mnangagwa. Mnangagwa has also lined up his own “thank you” rallies, expected to kick off when he returns from the Beijing summit on China-Africa Co-operation, which ends mid-next week.